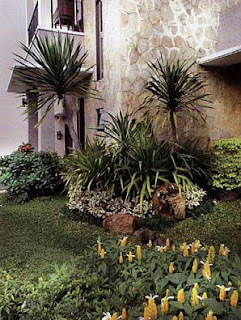 A good garden is a function that can synchronize between the environment surrounding the existing building. Likewise, the concept of a minimalist house would be great if the coordinate between the home and garden design is minimalist in order to establish a harmonious collaboration. Keep in mind you want to make the garden a natural minimalist. If you will do yourself or hire an architect to help make it, you need a basic understanding of space proportionately, the combination of hard materials such as steel, concrete, glass, wood, exposed brick and not both, stone, granite, coral, gravel, etc.) as well as soft materials such as "shrubs, trees, shrubs, grass, etc." precisely so that you as a home owner can obtain or produce a harmony, and harmony between the park and surrounding area, building houses, and interior space. Why do you need a basic understanding about this? Because if you expose the dominance of a certain materials can produce different effects differ according to your taste. Minimalist garden usually combine the application of simple and sophisticated technologies with you how to optimize natural materials, the complexity and philosophical symbolic meaning, pure and dramatization, colors and color matching. Knowledge and understanding of the appropriate or right for a minimalist concept of Western State and Eastern countries will generate a matching minimalist garden between the buildings surrounding environment you have. You should know that the Western concept of minimalism is to emphasize the combination of the essence of art and architecture, the precise composition and precision, proportional, the purity of the material, a clear hierarchy of spaces and neat, reflecting the quality of the local culture and thinking. The difference with the East minimalist concept is a bit much influenced Zen Buddhism. Park is a land that generally reflects the natural energy. Because of natural energy is the source of life, the presence of a minimalist home park you can provide the energy source of life for residents of the house or at least is the coolness of your heart. Usual minimalist garden we find a combination of easy maintenance, compact, stylish, space efficient, and effective use, making the home garden concept increasingly popular minimalist various circles, especially in metropolitan cities who long for a natural presence in the house. Minimalist garden are usually developed as a whole or only partially adjust to the available park land. Minimalist home garden can be built on the back or front yard, side yard, patio, etc..
Because of its function as a form of union with nature's house, several rooms in the house functions can be pulled out close to nature, such as living room and front porch garden, living room or dining room with minimalist garden beside him, semi-open bathroom in the park side. Park is located behind the minimalist can be developed as a family party comfortable enough. Minimalist garden could be developed to your taste each, such as a water garden and pond water plants, tropical garden of flowering plants / leaf colors, garden therapy, aromatic garden plants such as certain distinctive aroma, garden of life pharmacy medicinal plants, or if you love cooking you can have an herb garden for your cooking needs daily. Before you decide which type you like, then you need to consider an easy plant maintenance and maintenance. The presence of a compact minimalist garden, dynamic, practical, efficient, and effective will be able to make your house feel comfortable to get rid of your fatigue after working all day to enjoy cape dust increasingly stifling vehicle. And even by playing with the right lighting patterns can effect dramatic atmosphere, romantic, and the silence in the garden is minimalist in the evening. You need to emphasize that a minimalist garden is a garden that does not require maintenance and care for all complicated considered very practical.